They’re in the air. You can’t see them, but they’re part of the dust cloud that you can see, the big siblings of the respirable particles. The cloud is evidence that they’re there, lingering, waiting to sneak into the deepest recesses of our alveoli. Thanks to the OSHA Silica in Construction Standard, 29 CFR 1926.1153, quartz-busters—better known, in OSHA’s term, as “competent persons”—are on the job and ready, not with proton packs and ghost traps, but with sample analysis results and real-time dust monitors. OSHA representatives have alluded to the hope that their new regulation will encourage and catalyze technological innovation, not only for the control of dust, but for the detection of respirable silica. To that end, we field-tested four commercially available direct-reading dust monitors that utilize light scattering technology at an active construction site. This article discusses some of our observations and findings, and their potential for helping the employer’s competent person fulfill their OSHA-mandated duty. an individual who is capable of identifying existing and foreseeable respirable crystalline silica hazards in the workplace and who has authorization to take prompt corrective measures to eliminate or minimize them. The competent person must have the knowledge and ability necessary to implement the written exposure control plan required under the standard. [T]he competent person must make sure that an employee directing traffic (not engaged in the task), is positioned away and upwind from the employee who is jack hammering… . [The competent person] must also restrict access, when needed, for exposures generated by another employer or self-employed person. What if there is no “upwind”? What does “positioned away” look like inside a building under construction? Here the employer is challenged to convert noble statements about the competent person’s abilities, such as “capable of identifying existing and foreseeable respirable silica hazards” and “must also restrict access, when needed,” into practice. For comparison, under the OSHA Asbestos in Construction Regulation, carcinogenic asbestos fiber is highly regulated, requiring protective clothing, P100 respirators, and administrative and engineering controls. The concrete industry and the workers employed in this field grapple with identifying and implementing similar protections due to an ever-changing work environment and uncertainty around daily exposure levels. In addition, EPA prohibits asbestos fiber release into the environment, while the construction industry views the release of respirable quartz particles as a mundane occurrence. The competent person must be able to evaluate conditions in real time and make an informed decision when confronted with dusty situations. It is imperative at this point to recognize that most competent persons will not have the background of a professional industrial hygienist. Rather, the competent person is often a crew leader or member of management, with extensive experience in the work task to be performed. He or she is also someone who has been trained in, and fully understands, the hazards associated with each project, and is responsible for ensuring the safety of all persons involved, even if this means stopping work. If workers are lucky, this competent person is supported by an on-site safety professional who can help with sticky situations. With or without this help, accurate respirable silica exposure assessments are not easy to obtain. OSHA knew this when it developed the new silica standard’s Table 1, “Specified Exposure Control Methods When Working with Materials Containing Crystalline Silica.” A common reaction to the standard was that employers and their anointed competent persons could not realistically be expected to know how much silica exists within a work area with any degree of certainty, and definitely not in real-time. But what if there is a way to know exactly that? What if an IH could help a competent person by producing custom correction factors for a respirable dust photometer for the specific environments under the competent person’s responsibility? With training and guidance, can a competent person use the photometer in real time and make reasonable, defensible decisions when confronted with unknowns? Knowing that work areas are safely within, on the borderline of, or over the acceptable silica exposure levels could help to fulfill the competent person’s mandate and to bring balance to the problem of quartz overexposure. RESOURCES “A Study of the Response of Two Aerosol Photometers When Assessing Organic and Inorganic Dust Concentrations Relative to Standard Gravimetric Measurements” (thesis submission, 2000). Journal of Chemical Health and Safety: “Development of Custom Calibration Factors for Respirable Silica Using Standard Methods Compared to Photometric Monitoring Data” (January-February 2018). NIOSH: Manual of Analytical Methods, 4th Edition, Chapter G: Aerosol Photometers for Respirable Dust Measurements. OSHA: Small Entity Compliance Guide for the Respirable Crystalline Silica Standard for Construction (PDF, 2017). The Annals of Occupational Hygiene: “Comparison of Portable, Real-Time Dust Monitors Sampling Actively, with Size-Selective Adaptors, and Passively” (November 2007). THE DIRECT-READING SOLUTION We see photometers as potential aids to the competent person, with proper calibration and guidelines. To substantiate this hypothesis, we found a mannequin, a parking garage under construction, and some crucial help. Sprinkle in a grinder, and we were able to test a group of four commercially available photometers under real-world exposure conditions. We used Dorr-Oliver cyclones and side-by-side sampling (according to NIOSH methods 0600 and 7500) to calculate correction/calibration factors and to test these important values. Photometers are calibrated to an ISO-defined test dust; in theory, if measuring a dust cloud of the test dust, the correction factor should be 1, meaning the concentration measured by the photometer matches the actual concentration. When confronted with a dust cloud with a different composition (a different density, refractive index, or particle diameter), the photometer reading will need to be adjusted by a correction/calibration factor, which is simply calculated by dividing the gravimetrically determined concentration by the photometer reading, otherwise recognized as the ratio of the side-by-side gravimetric sample analysis to the photometer TWA concentration. For example, a gravimetric concentration of 3.37 mg/m3 side-by-side with a photometer TWA reading of 4.87 mg/m3 gives a correction factor of 0.69 (3.37/4.87). A correction factor of 0.69 means the photometer will read a higher mg/m3 concentration than would be reported from a gravimetric sample obtained through NIOSH method 0600. Paramount to this study was our ability to focus on respirable-sized particles since research has established that photometer response is most sensitive within the respirable size range. Light scattering theory predicts a linear response with increases in particle concentration, provided density, diameter, and refractive index remain the same. If particle density, refractive index, or diameter change, the photometer response will change, and a new correction factor will need to be discovered. We performed four test runs in one day and then used an average correction factor from the first three runs to correct the photometer concentration reading of the fourth run. We then compared these results with the side-by-side NIOSH 0600 and 7500 analysis data. The outcome of this study is shown in Table 1 above. Note that one photometer, not designed to be worn, was placed next to the mannequin, and the second of two gravimetric samplers was placed on the mannequin’s arm. During run 4, all of the samplers were bunched together during monitoring. The fourth photometer utilized a different size-selective adaptor and flow rate, so it was only run twice. We calculated correction factors of 0.64 and 0.67. The results show that we can make a reasonable prediction of the respirable dust concentration by utilizing well-developed correction factors. REAL-LIFE APPLICATION One of the drawbacks to using Table 1 in OSHA’s Silica in Construction Standard is that it does not apply to persons working in the vicinity of the operation. A competent person might observe employee A operating a saw with water delivery near employee B, who is taking structural measurements. Employee A is wearing a required respirator, but employee B is engaged in a task not covered by Table 1 and is not wearing a respirator. Is employee B “safe”? Is he or she upwind? Does the competent person need to restrict access? In this scenario, NIOSH 0600/7500 samples of the saw operation may not be available for reference. A trained competent person, equipped with a real-time photometer and respirable size selector, could interpret the photometer readings to make reasonable determinations about area silica concentrations. That competent person could then deem an area accessible to other workers, or conversely, recommend additional protections for those in the areas surrounding a covered operation. An IH would be able to gather the measurements necessary to calculate the correction factors and provide a competent person with the training and tools to use a photometer in this type of scenario. One of the tools that could be developed is a color-coded guide like the one shown in Figure 1. 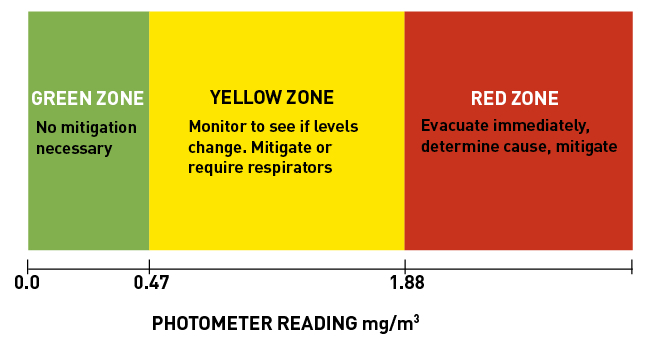 The colors correspond to photometer readings that allow the competent person to tell (for example) whether workers should be required to wear respirators. With this guide, the competent person can take an initial reading at a problem area and see what zone that reading is located in without having to make any calculations. Most competent persons will not have the background of a professional industrial hygienist. Rather, the competent person is often a crew leader or member of management, with extensive experience in the work task to be performed. Tap or click on the table to open a larger version in your browser. Figure 1. A color-coded guide can allow quick evaluations of photometer readings. Tap or click on the figure to open a larger version in your browser. Figure 2. The orange line depicts respirable silica concentrations over time, and the black line represents the photometer reading that corresponds to an exposure likely to exceed the OSHA PEL after 2 hours. Figure 2 provides a closer look at the theory behind this guide. The y-axis represents the respirable dust concentration reading from the photometer. The x-axis, with time of event, is used, with the orange dust concentration line, to show the changing levels of dust during a certain time period of our testing. As in Figure 1, the red, yellow, and green zones represent three different decisions that the competent person can make. The zones are determined by some key assumptions. We decided that any concentration above 0.2 mg/m3 respirable silica, which means an exposure time greater than 2 hours, will lead to an exposure above OSHA’s Permissible Exposure Limit of 0.05 mg/m3 (eight-hour time-weighted average), was in the red zone, and required immediate stoppage and evacuation and then investigation and mitigation. We used a respirable dust correction factor of 0.71 and assumed a quartz percentage of 15 percent to determine what photometer reading corresponded to the 0.2 mg/m3 respirable silica concentration—in this case, 1.88. It is important to keep track of which concentrations are respirable dust and which are respirable quartz (silica) because the photometer is reporting respirable dust, not respirable silica dust. We decided the green zone should correspond to the PEL level. The yellow zone instructs the competent person to continue to measure to see if the levels change. If the concentration stays within the yellow zone, the option is to evacuate and mitigate or, if possible, create a regulated area and require respirators. The active construction site where we conducted testing had respirable dust background levels ranging from 0.04 mg/m3 to 0.10 mg/m3. Construction companies may want to use industrial hygienists to measure respirable dust background levels with NIOSH 0600/7500 methods and begin to gather historical data. It also seems that a competent person may not be able to realistically measure respirable dust concentrations below 0.05 mg/m3 with a photometer and assume that the silica levels are less than the PEL simply because a construction site will never be that clean. As reported in other studies, we found that the concentration levels around the side-by-side gravimetric samplers and photometer were not uniform at the mannequin. This is a contributor of error that should be understood. MEETING THE MANDATE A word of caution: the method and guideline described in this article are intended for the competent person’s use and are designed to meet the OSHA mandate for a competent person. They are not intended for the purposes of exposure sampling or exposure compliance. The IH and the employer can determine how many zones they want and how they want to define those zones. The outcome should be a defensible, tested, and field-validated product that, in our opinion, will make the competent person more informed and prepared to carry out his or her directive. We have much work to do and much to learn before we could confidently, as an IH service, assist an employer with the calibration of a photometer and train a competent person on how to use it. But the road is much clearer now than when we started. FRANCISCO TRUJILLO, CSP, MSOS, MBA, is vice president at Miller and Long Concrete Construction in Bethesda, Md. DONALD EWERT manages stewardship and sustainability services for RJ Lee Group, located in Monroeville, Penn. COREY BENDER, CIH, CSP, is an industrial hygienist at WMATA in Washington, D.C. Acknowledgement: The authors thank Miller & Long Co. Inc., a concrete contractor in Bethesda, Md., for its support and funding, and RJ Lee Group for conducting crystalline silica air sample analysis. We also thank Emanuele Cauda, senior fellow and deputy director of the NIOSH Center for Direct Reading and Sensor Technologies, Pittsburgh Mining Research Division, for his technical assistance. Send feedback to The Synergist.